It is hard to look and feel your best if you have loose skin over your eyes or bags under your eyes. Your eyes are the central feature of your face, and signs of aging around your eyes may be the first thing people see. If your eyes are telling the world that you look more tired, or older than you feel, you may want to consider laser eyelid surgery in Sacramento, a procedure also known as blepharoplasty. Eyelid surgery can take years off your appearance by correcting drooping, swollen eyelids to make you look more youthful and even more energetic. Eyelid surgery eliminates excess fat, skin, and muscle from the upper and lower eyelids. Dr. Green can perform this procedure to correct drooping upper lids and puffy bags below your eyes – features that make you look older and more tired than you feel – and may even interfere with your vision. It may also improve crow’s feet or other wrinkles, as well as dark circles under your eyes, but will not lift sagging eyebrows. While it can add an upper eyelid crease to Asian eyes, it will not erase evidence of your ethnic or racial heritage. Facial plastic surgery procedures including facelifts and brow lifts are often combined with the blepharoplasty procedure for a more complete facial rejuvenation. Women can include eyelid surgery in their Mommy Makeover in Sacramento for a more comprehensive improvement. Eyelid surgery usually takes 1 to 3 hours to perform. For patients who visit us from communities such as Roseville, El Dorado Hills, and Folsom, this plastic surgery procedure is almost always performed under intravenous sedation with local anesthesia. The patient is drowsy, pain-free, and unaware of the procedure that is being performed. It may be combined with a facelift or brow lift surgery. Generally there is only minimal pain (tightness and soreness of the eyelids) following this procedure, however modest bruising will be present. Patients are encouraged to keep their heads elevated to help reduce the bruising and swelling. Bruising is mostly gone after 8 to 10 days and sutures are removed (if present) in 4 or 5 days. Makeup can be worn to cover any remaining bruising or discoloration. Sunglasses and sun block should be worn for the first few weeks when you are outside. Some patients experience sensitivity to light and mild vision blurring for a few weeks. You will be able to resume your typical activities within 1 to 2 weeks and strenuous activities within 2 to 3 weeks. 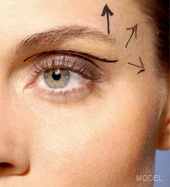 There are variations on the types of eyelid surgery that can be performed. Every patient should become educated on the various procedures available and through consultation with their plastic surgeon elect the procedure that best suits their needs. Dr. Scott Green performs both a traditional blepharoplasty and a laser eyelid surgery. In a traditional blepharoplasty incisions are made along the natural lines of the eyelid in order to conceal any scarring. Some lower eyelid surgery can even be performed from the inside, completely concealing any trace of scarring. With a laser blepharoplasty a laser is used to make an incision in the conjunctiva of the lower eyelid (inside the eyelid), after which the fat is removed with the laser. The advantage of this procedure is that there is no visible scar on the lower eyelid, bruising is rare or minimal, and the patient may return back to work more quickly than with the traditional blepharoplasty. As with any cosmetic surgery, be sure to follow your plastic surgeons instructions regarding taking medications and vitamins, eating, drinking and ceasing smoking. If you’re considering eyelid surgery, this information will give you a basic understanding of the procedure: when it can help, how it’s performed, and what results you can expect. It can’t answer all of your questions, since a lot depends on the individual patient. Please schedule a consultation with Sacramento plastic surgeon Dr. Scott Green to discuss what blepharoplasty can do for you. Call 916-929-1833 to schedule a consultation today.